Exclusive Presale extended. Go ahead, make your summer plans today! 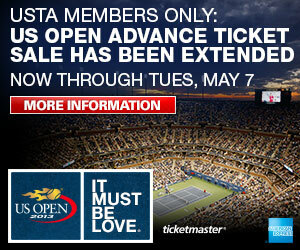 Exclusive ticket access to the US Open has been extended through May 7, 2013! USTA Members have the opportunity to purchase tickets before they go on sale to the general public plus access to VIP hospitality packages. Go ahead, make your summer plans today!